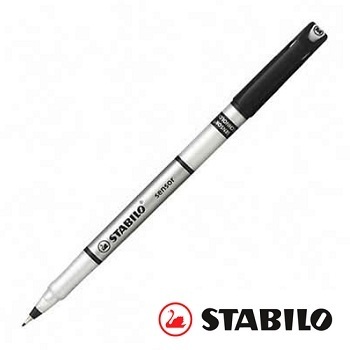 A fineliner pen is a writing instrument with a fine fibre (felt) or nylon tip. The tips are generally long and metal-clad to allow use with rulers and templates without bending. Fine liner pens are ideal for precise everyday writing and especially good for drafting, sketching and drawing. Many people prefer the smoothness and unique feel of the fineliner tip to the more traditional ballpoint pen. Most fineliners are available in a large range of ink colours... Check out the Stabilo Point 88! Xylene Free. Fast-drying waterproof ink that won't smudge or fade. Fine 0.4 mm plastic tip fineliner pens. Box of 12 pens. Barrel colour denotes ink colour. Medium 0.6 mm plastic tip fineliner pens. Box of 12 pens. Cap colour denotes ink colour. Super Fine 0.2 mm plastic tip fineliner pens..
Intense black fineliner pen ideal for fax and photocopy work. Xylene free. Dense black water-based ink. Fine 0.4 mm line width blur proof fineliner pens. Box of 12 pens. Black ink colour. The original fibre tipped pen... and still a best seller! Dense colour is ideal for faxes - fibre tip guarantees an even flow of ink. Acid free. Medium 2.0 mm bullet point tip marker pens. Writing distance over 900m. 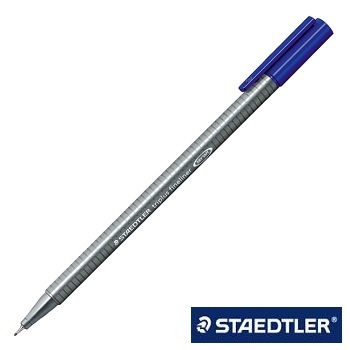 The STAEDTLER triplus fineliner has an ergonomic triangular barrel that relaxes strain on the hand and offers excellent writing comfort. DRY SAFE: can be left uncapped for day without drying up (test ISO 554) Airplane safe. Super Fine 0.3 mm line width metal clad felt-tip fineliner pens. Box of 10 pens. Cap colour denotes ink colour. With patented cushioned tip technology - the tip adjusts to writing pressure. It won’t bend or break, no matter how hard you press. Unique with a high-quality aluminium look. Ventilated cap. Fine 0.3 mm line width. Box of 10 pens. Barrel and cap colour denotes ink colour.